Dan blogged about a pictorial look at the iTunes icon evolution over time and that got me to thinking about how iTunes has changed since iTunes 1.0 (which I used, though I imagine lots of our readers didn't). Being the self starter that I am I decided to compare the last 7 versions of iTunes by showing screenshots of each version (and of the store starting in iTunes 4.0). Read on to see the pictures, most of which come from the fabulous GUI Guidebook. 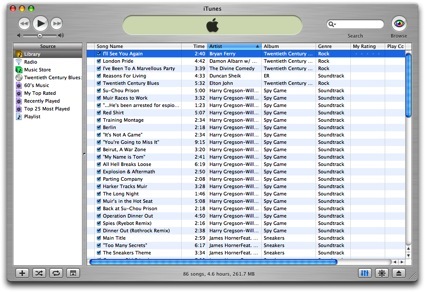 Early 2000: SoundJam MP by, the now out of business, Casady & Greene was the basis for iTunes. Didn't know that, huh? Yep, Apple liked it so much that they bought the rights to it and hired its developers to write iTunes. Read all about it on Wikipedia. 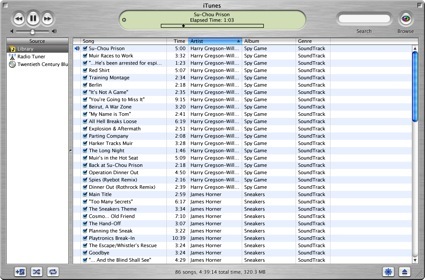 January 9, 2001: Ah, iTunes 1.0. This started iTunes mania, folks, and it only ran on OS 9. Those were simpler times, when 86 MP3's seemed like a lot. Apple touted that with iTunes you could store an unlimited number of MP3's, burn CD's (using CD burners that Apple has just added to Macs) and watch a 'visualizer,' which was totally trippy, dude. October 23, 2001: 9 months after introducing iTunes 1.0, Apple announced iTunes 2.0 which ran in either OS 9.2.1 or OS X 10.2. The big ticket items were MP3 CD burning, an equalizer, and cross fading. More and more folks were getting into the whole iTunes thing, but it was still Mac only much like the iPods (which were also introduced this year). 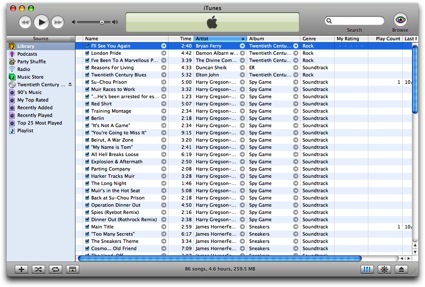 You could transfer 1000 songs from iTunes to your iPod in 10 minutes. Truly, this is the future. No one knew then that iTunes and the iPod would be such a killer combo. 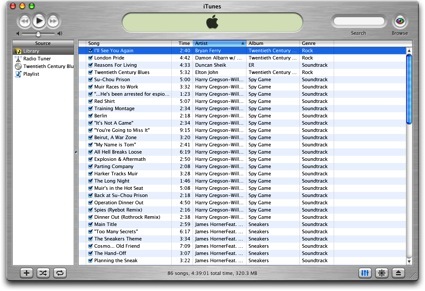 July 17, 2002: iTunes 3.0 introduces smart playlists and Sound Check (that makes sure all your songs play at the same volume level). Audible.com support was also introduced in this version of iTunes. 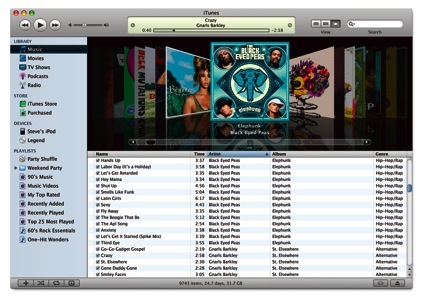 iTunes 3.0 dropped OS 9 support altogether, requiring OS X 10.1.4 or greater. 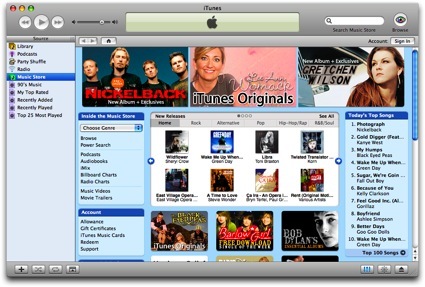 April 28, 2003: iTunes 4 was all about one thing: The iTunes Music Store (seen below). Starting off with 200,000 songs the store made a big splash, but it was Mac only. 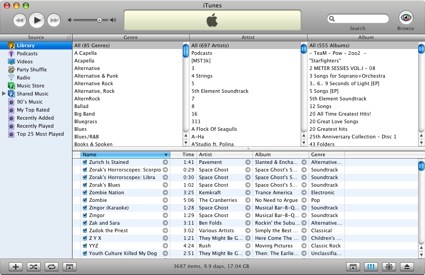 iTunes 4 was the first version to include Rendezvous™ (now Bonjour) music sharing, which was pretty darned cool. 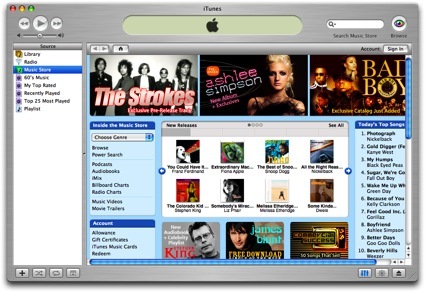 October 16, 2003: iTunes for Windows was introduced to sell more songs and iPods (the iTunes Music Store in OS X is pictured above). Mac users bemoaned the fact that first they had to share iPods with PC users, and now they had to share iTunes. Hell had frozen over. Apple also teamed up with AOL to offer one click purchasing using AOL screennames, added audiobooks to the store, and added the 'Allowance' feature. 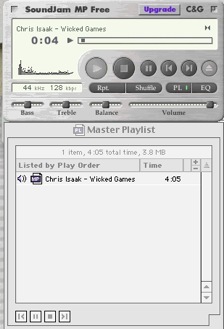 Oh, and podcasts in the Music Store too, thought that didn't happen until June 28th 2005. September 7, 2005: iTunes 5 breaks on the scene and everyone asks, what's up with that plastic looking thing in the main window? 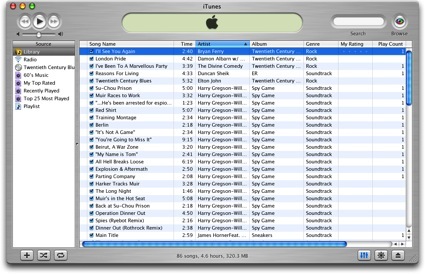 iTunes 5 introduced improved search, Smart Shuffle (people complained the iTune's shuffle wasn't random enough), and folder support. 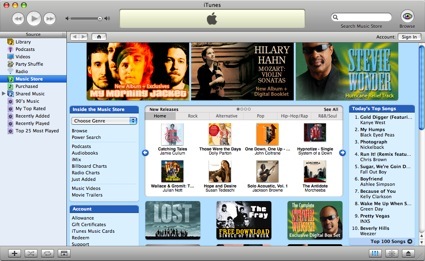 The iTunes Music Store in iTunes 5. More than 2 million songs are available. October 12, 2005: Just 2 months later (which really confused people) iTunes 6 busted onto the scenes. The biggest news here (as seen below) was the addition of short films (from Pixar) and TV shows (from ABC) in the iTunes Music Store. $1.99 gets you an episode that you own forever and ever. 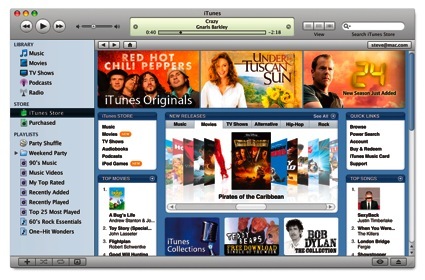 September 12, 2006: iTunes 7 introduces a number of new features, including an overhauled IU and movies for sale (Disney only, once again). A name change for the iTunes Music Store finally arrives, now it is simply the iTunes Store. The store offers videos at quadruple the resolution, and you can even get games for you iPod now. The newest look for the iTunes Store. Where will the future lead us? Only his Steveness knows for sure.